A rectangular slab of matrix showing a 3D calcitic Asteroceras. 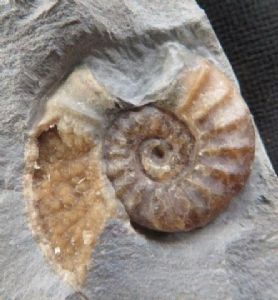 At the beginning of the outer whorl there is an elliptical puncture would with the shell missing. This is a definite bite mark from either a fish or reptile! Superb example.